Sun? Check! Sand? Check! School is out, and it's time for some fun in the sun. Whether you're fighting the summer slide, preparing for a road trip, or your kid needs a break from the heat, these Summer worksheetsOffer a fun and educational solution. From maths and creative writing to coloring, our Year three worksheetsOffer engaging ways to stay sharp over summer vacation. How many days are in August? Teach your child how to use a calendar to find the date or the day with this great introductory worksheet. Channel your inner news reporter and learn more about those around you. Find out once and for all which fruit is the most popular with this survey. This mandala coloring page celebrates the summer season and summer produce, featuring a sunflower, strawberries and avocados ripe for coloring-in! 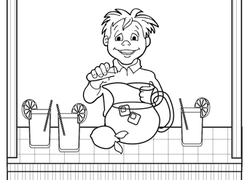 The summertime coloring page features a boy selling lemonade at a lemonade stand.